Celebrate the Winter Solstice with two of the wildest imaginations in underground bass music. Dubby glitch legend ANDREILIEN is coming off the release of his Ergot Curry album, and is ready to unload incredible new tunes on Asheville. 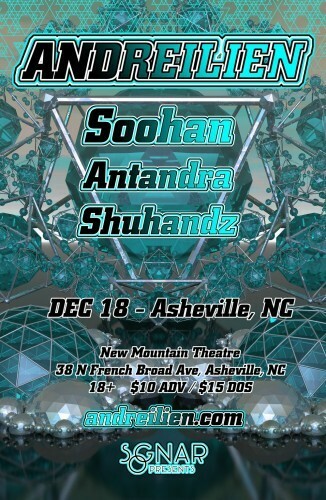 Up-and-coming tribal trap and mystical mash-up producer SOOHAN makes his Asheville debut on this very special night. 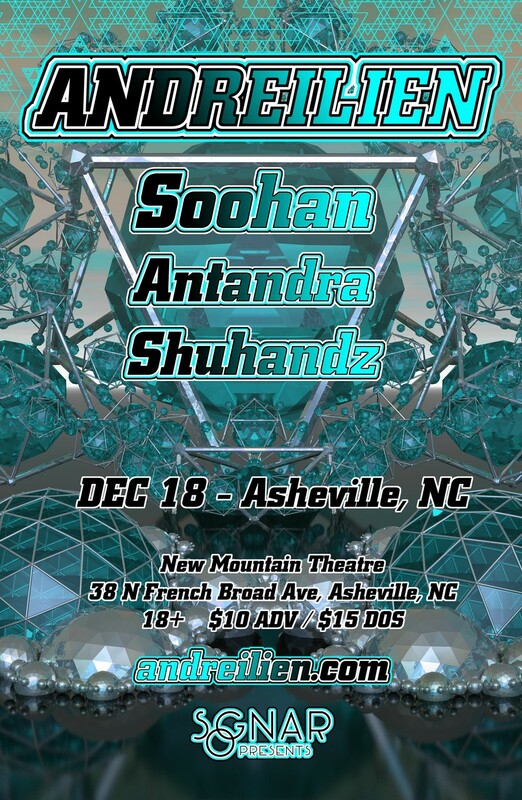 Asheville faves Antandra and Shuhandz will get the sonic adventure started properly. Save some money and grab them online! Andrei Olenev first emerged on the San Francisco underground glitch/bass scene in 2006 performing under the moniker, “Heyoka.” By 2009 he was touring extensively, and quickly became a staple sound in the rapidly growing bass music scene of North America. He has since gained international recognition and established himself as a pioneer of psychedelic bass music. Andreilien has a constantly evolving sound with a solid foundation of deep sub bass and heavy psychedelia, combining influences of many musical styles, without confining itself to any particular genre. Playing always live sets of his original tracks, Andreilien maintains a heavy club and festival tour schedule. He has performed in North American festivals such as: Symbiosis, Sonic Bloom, Raindance, Lightning in a Bottle, The Bounce, Alchemeyez, and large Burning Man sound camps such as Nexus, El Circo, Camp Questionmark, Temple of Boom, Entheon Village, Roots Society and Fractal Nation. He has also played several international electronic music festivals such as Shambhala (Canada), Boom (Portugal), Earthfreq and Winter Solstice (Australia), Envision (Costa Rica) and Luminate (New Zealand). As Heyoka, Andrei released his first ep in 2008, and by 2011 had produced over six albums through San Francisco’s Muti Music, a leader in the glitch hop and bass music scene. After launching Andreilien, he continued to develop his sound, culminating in the releases of “Dub Iteration” and “Antikythera.” Andrei has since taken a couple of years to evolve and reinvent his musical style, resulting in his latest album, “Ergot Curry,” in which he delves into different styles and sonic experimentation. Further expanding his repertoire, Andrei has been continually working to develop a multimedia project with original Visionary and 3D art to create full sensory fractal journey, which he plans on touring with in the future. His Debut album “Made In Baltimore” made a giant splash, becoming an immediate internet sensation, garnering over 250,000 plays in four short months. The widespread popularity of the album earned him a slew of press coverage, with features on major outlets such as The Untz, Your EDM, and ThisSongSlaps, multiple opportunities to collaborate with well-established producers, and a main stage set at the notorious Emissions West Coast Bass Festival. He was signed to Re:Evolution Booking Agency, home to renowned acts like Desert Dwellers and David Starfire. The tracks on Volume Twohan pay homage to the mighty 808 kick, but it’s his unique and extensive sample selection that makes this work truly memorable. He takes us on a multi-faceted journey across the globe and into the past, pulling from the traditional music of various cultures, and from the depths of our nostalgia. Antandra is the future dub moniker of music producer and performer, Jacob Louis. His sound can best be described as bass infused rhythms with suspenseful atmospherics and etheric melodies. He has releases featured on Jumpsuit Records, LostinSound, Mycelium Music and Pure Perception Records, and has performed his original music at Kinnection Campout, CoSM, Burning Man, Unitus, T.O.U.C.H. Samadhi Equinox and many more! He has shared the stage with numerous world class artists including the likes of Desert Dwellers, Sixis, Ott, Kalya Scintilla, AtYyA and Globular.